The focus here was to look at key areas that allow you to perform regardless of the environment or task. 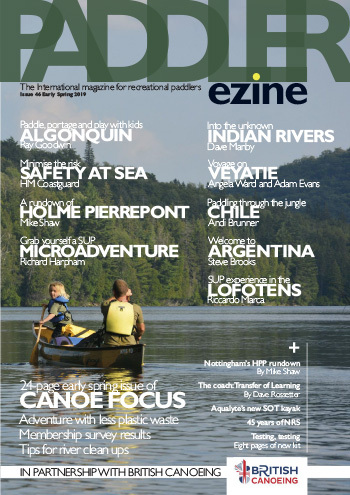 In this article I want to focus in on one of the traditional skills of the canoe poling and how these areas impact on your performance. The act of using a pole to propel the canoe. Generally poling is moving upstream. 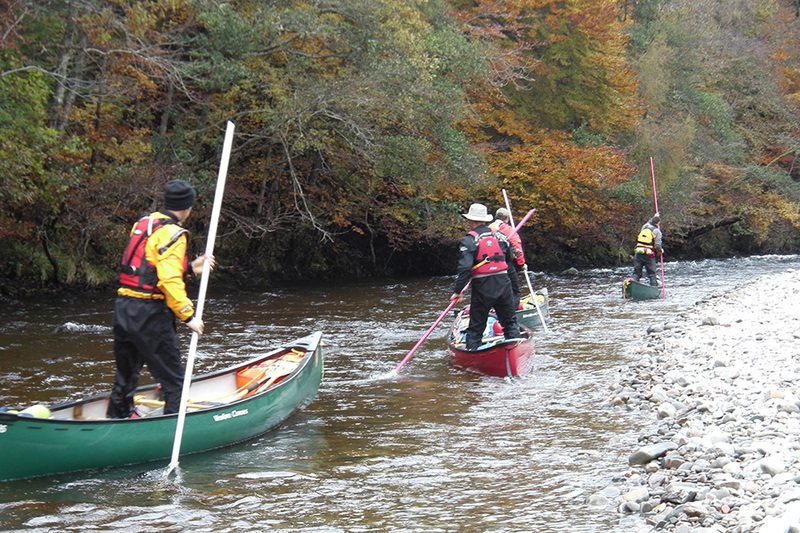 We also use the pole to descend down shallow sections of river – known as snubbing. 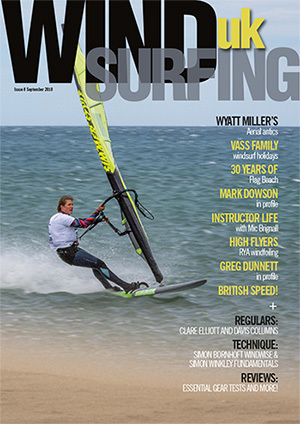 This article will look at poling. Moving upstream trim slightly towards the stern. Moving downstream Trim towards the bow. 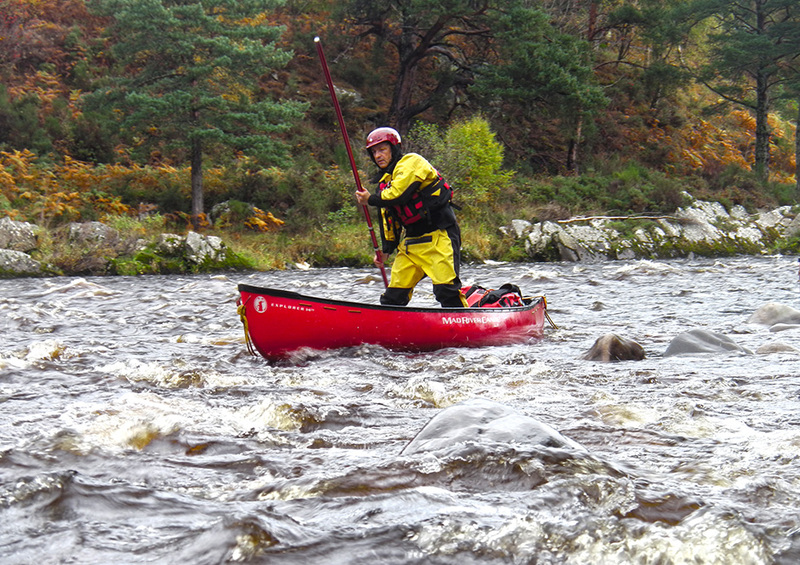 Poling in the UK often only gets covered when paddlers are going through the Star Awards. 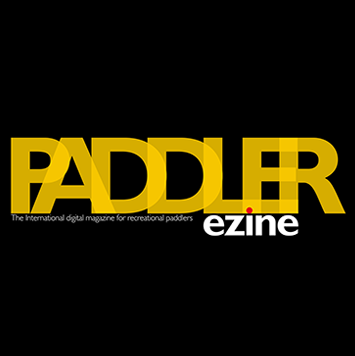 However, I believe that the pole can be used to add so much more to the options of paddlers looking to journey when the conditions are not favourable for the paddle i.e. moving upwind close to the shore, moving against flow or just when it’s too shallow for the paddle. It can also give you a change of position in the canoe so when your knees are sore it’s time to stand! 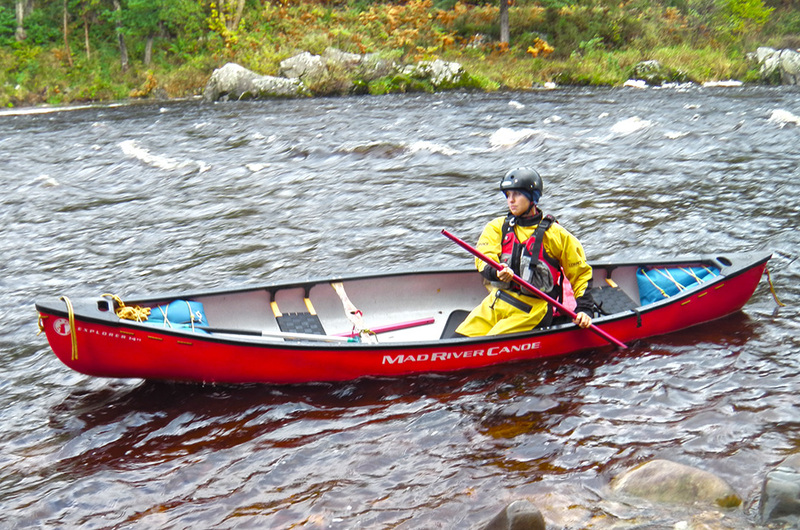 Getting the canoe moving you need to ensure that the pole is placed behind you in contact with the ground. Short stabs then to propel forward. When using the half-pole ensure that the closed end contacts the ground and not the open end. 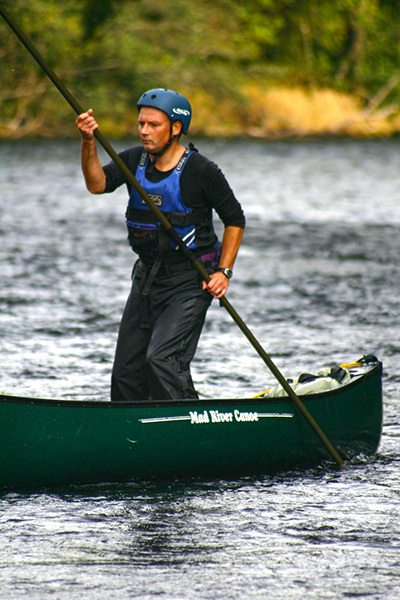 The squared off stance allows you to steer more through your feet and control the angle and tilt of the canoe prior to pushing off the ground. Second position is having the feet off-set. 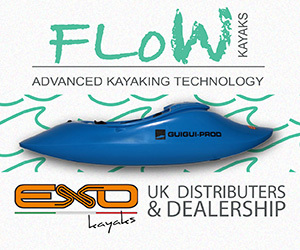 This gives you the ability to apply more power on the on-side, however, some paddlers feel less stable, which makes it harder to use both sides of the canoe. The off-set position allows you to apply weight forward and back as required to change the trim. Whatever stance you choose it is important to keep the knees soft/bent to allow you to absorb your movement and stay in balance. Keeping the knees soft allows you to change your height, which in turn adds pressure to your pole which in turns provides momentum without just using your arms. To get the best out of your poling and allow you to deliver the most amount of power then having a hand position that allows you to get the front hand outside the gunnel is important. Front hand should be palm up with the pole on top of the hand. 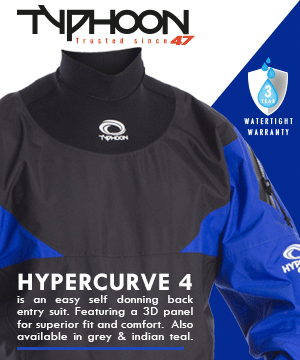 This ensures that the hand can get outside the canoe and provides the best position for delivering power. The lower hand should be palm down. This will give you support when you feel off balance as you can push off the pole. When pushing off the ground you need to ensure that the pole is behind the feet with an angle of about 45 degrees. This will give the optimum position for contact with the ground and forward propulsion. Too low an angle and far back will result in stooping and being off balance whilst too close to your feet gives very little forward power. The direction of where the top of the pole is facing before you apply power to it is where you are heading. This control of angle will see you moving under control. As previously mentioned, the first job is to sort out your angle then provide the power. This can be done by pressing down with the back hand and back with the top or front hand. Combining this with a slight bending of the knees moves the canoe. 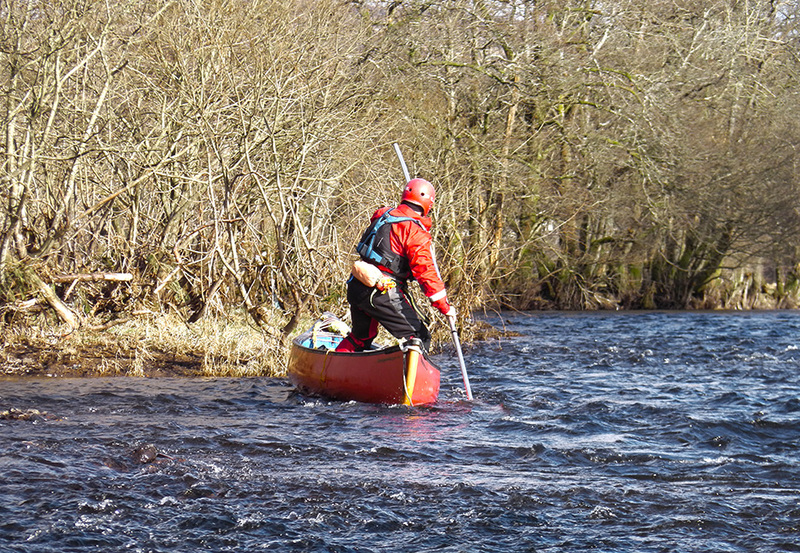 Short stabs allows you to keep the pole in contact with the ground for longer which prevents the canoe going off course or having to do too much steering. Often polers provide too much power and walk up the pole which means once you have used that power you need to control/correct it. This leads to the environment taking over be it wind or current. Using these short stabs means that your hands don’t need to move along the pole, which will help with gaining speed. There will be a time when ‘walking’ up the pole with the hands will be appropriate – such as going up ledges. However, for the most part, I find that my hands stay fairly static on the pole. 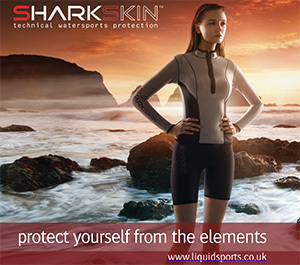 The next time you are out on flat sheltered water then have a shot. On that same section stand and use the pole. Then as your skill and confidence increases you can push the environment. 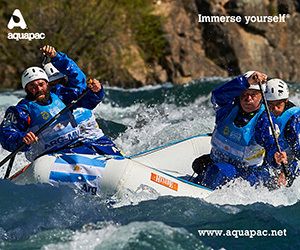 Your last challenge is to use the knowledge gained moving against the flow is to try and snub down river. This is all about control/trim and controlling your angle by keeping the speed down. Good luck and don’t leave home without your POLE! 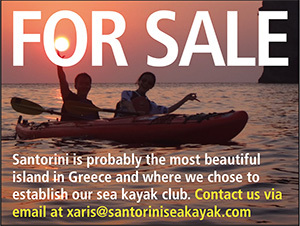 Happy paddling and hope to see you on the water. 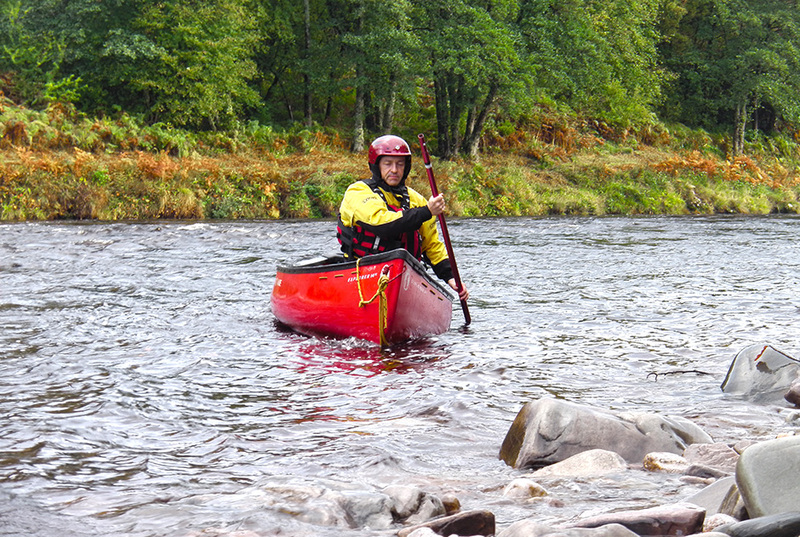 Dave is the full time paddlesport instructor at Glenmore Lodge – Scotland’s National Outdoor Training Centre. 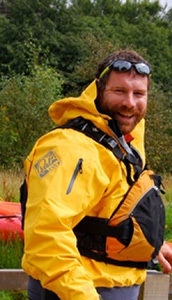 He has been involved in the development of the new awards and provides expert advice throughout the industry on all things to do with coaching, safety, leadership and personal paddling. 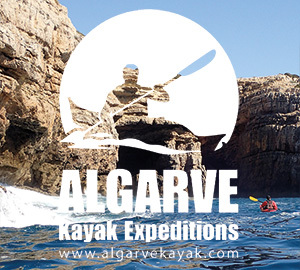 He is passionate about all things paddling and specialises in white water kayak and open canoe where he will most often be found. 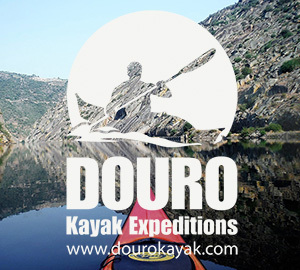 He is supported in his paddling adventures and coaching by Pyranha Kayaks, Mad River Canoes and Palm Equipment.